Do you see various advertisements while browsing the Internet? It means that you have Squirrel Web installed onto your computer. This sneaky adware is usually installed together with other programs and starts displaying various advertisements the moment it gets on the system. This adware can appear on those computers which use Windows XP, Windows 7 or Windows 8 operating systems. You should remove this adware instead of keeping it on your computer because it might be the reason of different threats. 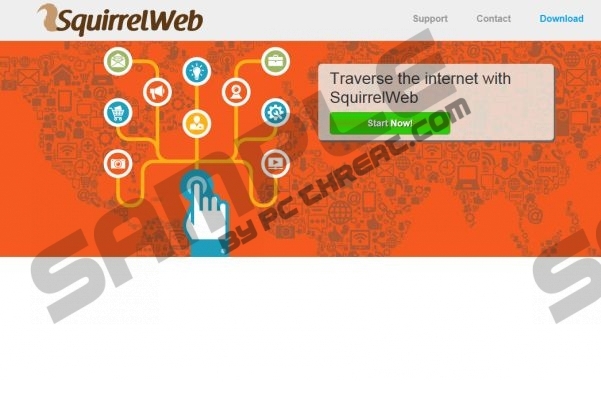 Squirrel Web shows various advertisements on such browsers as Internet Explorer, Google Chrome, and Mozilla Firefox. It also adds extension to all of them. You cannot recognize this adware from the type of the advertisements because it tends to show a variety of them, including search, banner, text link, transitional, interstitial, and full page advertisements. These advertisements usually promote various commercial services and products. You should not think that these advertisements are totally innocent because they might lead you to the websites with a malicious content. Do you think that the publishers of the software take care of their customers? Unfortunately, we have to upset you – Squirrel Web claims to be not responsible for the content of the third parties in any sense, which means that you are left on your own. The best what you can do is to remove Squirrel Web straight from your computer. It has been noticed that this adware might be distributed together with other programs, especially freeware. However, there are some tips which might help you avoid Squirrel Web and other similar software. First of all, you should always select custom installation and then uncheck all the components which are bundled together with it. All the installation steps should be followed carefully. Secondly, you should download software from reliable sources. If you follow these pieces of advice, there is a huge possibility that you will be able to protect your computer. You have two options if you want to remove Squirrel Web from your computer. You can remove it manually and then scan your system with a reliable antispyware tool or you can remove this adware with a help of antimalware program only. Our specialists recommend using SpyHunter because it is a very useful tool which would delete Squirrel Web without any difficulties. Besides, it is definitely able to protect your computer from future infections. Go to Add or Remove Programs and select an unwanted application. Go to the Task Bar and then click the Start button. Right-click on the program which you want to delete. Right-click anywhere on the background and select All apps. Find the Control Panel and select it. Go to Uninstall a program and find the program which you want to remove. Quick & tested solution for Squirrel Web removal.